Patriotism – Is it a crime now? Since the Devolution Act gave Scotland, Wales and Northern Ireland their own assemblies and parliament, there has appeared to be a resurgence in England of national identity. For example, when England won the world cup at Wembley in 1966, the terraces were awash with Union Jacks – Fast forward to the 21st Century, and the Cross of St George is far more prominent than the British Union Flag at sporting events across the board. 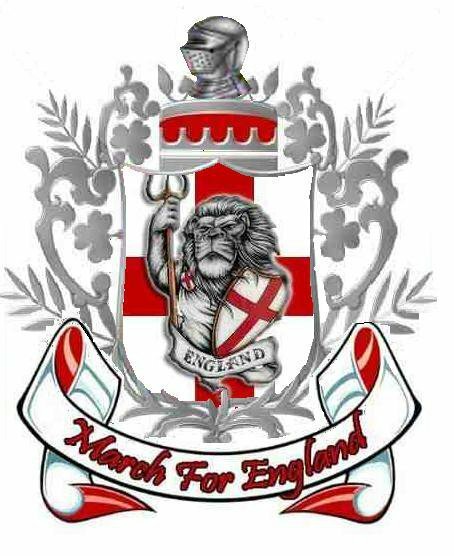 I recently attended the March For England annual parade in Brighton to mark St George’s Day.There seems to have been renewed interest in celebrating our patron saints day, with calls from many to make it a bank holiday in the same way that the Irish and Scots get bank holidays to celebrate their saints and national identity. This is the fourth year that MFE have arranged a day out in Brighton to mark the occasion – Previous years have seen kids face painting, food in the pub at the end of the parade, and a good family atmosphere around the event. 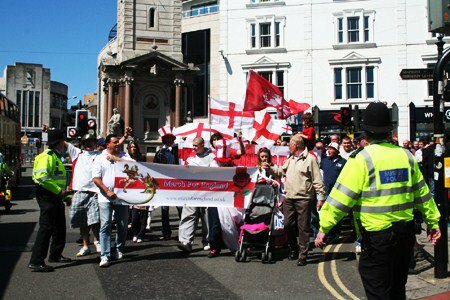 In the four years that ‘Pompey Dave’, the organiser, has run this parade there have never been any arrests amongst the patriots celebrating St George, and a great deal of money has been raised for charities – This year, over £1000 was raised for a forces charity. Above is a picture of the 2010 parade – As you can see, the event was lightly policed and people of all ages came along to enjoy a day out. MFE organised the route and times with the local constabulary, and everything went off like clockwork as usual. However, at the end of the event there were some instances of abuse and intimidation aimed at the MFE contingent by local members of left wing groups such as AntiFA and The UAF (Unite against fascism), who seem to think that waving our flag is akin to being a football hooligan or a racist. You have to ask yourself – Would they be throwing these kind of insults at Scotsmen waving a saltire on St Andrew’s day, or an Irishman with his tricolour on St Patricks? We met up in The Railway Bell pub opposite Brighton national rail station, and a police line was stretched across the street between the pub and the UAF on the other side of the road. Even at this early stage, abusive language was being hurled in our direction – Hardly what you would expect from people who are concerned with stamping out fascism and racism in our society. With this protest split up, groups of UAF shadowed the march hurling insults and, in some cases, missiles at the parade. – I was hit in the back with an egg just before we got to our destination in Victoria Gardens where we were to be addressed by a lady who lost her son in Afghanistan. One particularly loud youngster pointed at me and shouted ‘homophobe’ – I enquired back that if she was so worried about discrimination against our gay population, why was she protesting at a St George’s parade rather than in Tower Hamlets where one of my gay friends has had threats and leaflets pushed through his door? “Fascist!”, she yelled back at me – I take it that she is not studying debating skills at University, then! Another UAF intellectual started shouting in my direction that “St George wasn’t even English” – I replied back that we are all well aware of that, and as he is patron saint of many countries wouldn’t he agree that St George is a great role model for an integrated and multi-racial society? Cue another torrent of profanity and abuse. 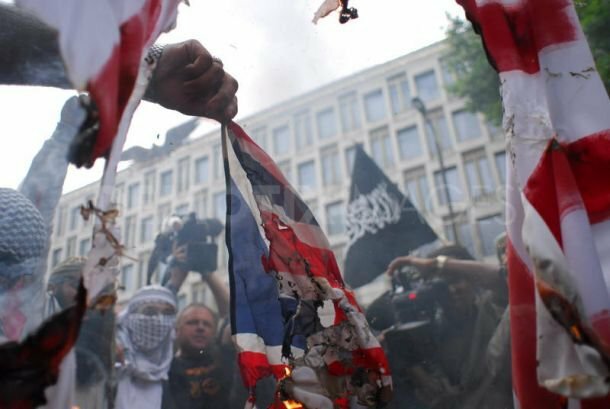 This photograph (above) was taken in London last year, and shows Islamic Extremists burning flags in London. Contrast that with the earlier picture of the 2010 MFE St George event, where families can be seen enjoying a day out. Despite this, the politically correct brigade will throw all sorts of accusations at you merely for being proud of your country, but woe betide anyone who criticises the likes of Anjem Choudhary and his followers when they create scenes like this. Don’t the UAF realise that by constantly bleating about ‘Islamophobia’, they are promoting extremist behaviour above our own culture whilst driving a wedge between decent,law abding Muslims and the rest of our population? Don’t they realise that by condoning the behaviour of extremist elements in our society and stopping the authorities from cracking down on them, they are actually fuelling recruitment for the far right groups that they oppose? Their ridiculous behaviour and refusal to discuss and debate on any issues actually exacerbates the problems that they claim to want to sort out. Unfortunately, many of our leading politicians and trade unionists are signatories to the UAF founding statement, giving the thuggish behaviour described above a veneer of respectability that it does not deserve. Many of you will have been horrified by the sight of poppies being burned last Remembrance Day by the extremist group, Muslims Against Crusades (MAC), whilst they chanted for death to our soldiers . I have yet to speak with any of my friends amongst the Asian English community who was not disgusted with what they saw – Yet only two of the MAC were arrested, and only one of them was actually fined for what they did (A paltry £50), despite this being a highly provocative act and one that was very likely to incite violence and fuel religious intolerance. Contrast this with the recent case of a man in Cumbria burning The Koran – He got seventy days in prison. Whilst I would never condone the burning of any religious book, where is the consistency in the ruling? Why are our courts so scared of punishing these fanatics? None of the ‘minorities’ I have spoken to would have been offended by a much more severe punishment for the members of the MAC! Then we had the case earlier this week of English Defence League (EDL) Leader ‘Tommy Robinson’. Mr Robinson was in court in Hammersmith on a public order offence charge that related to him grabbing a black Islamic battle flag from one of the MAC during the aforementioned ‘poppy burning’ incident. He had previously been charged for assaulting a Police officer, but when that case collapsed he was then charged with the Section 5 Public Order offence. Finding against him, the magistrates imposed a £315 fine – Yet Emdadur Choudhry, the poppy burner, got just a £50 fine on a similar section 5 and has shown no remorse for what he has done! He has also been quoted in the press as saying that he will pay his £50 fine out of his benefits payments! It appears clear that years of political correctness have now led to the ridiculous situations described above. 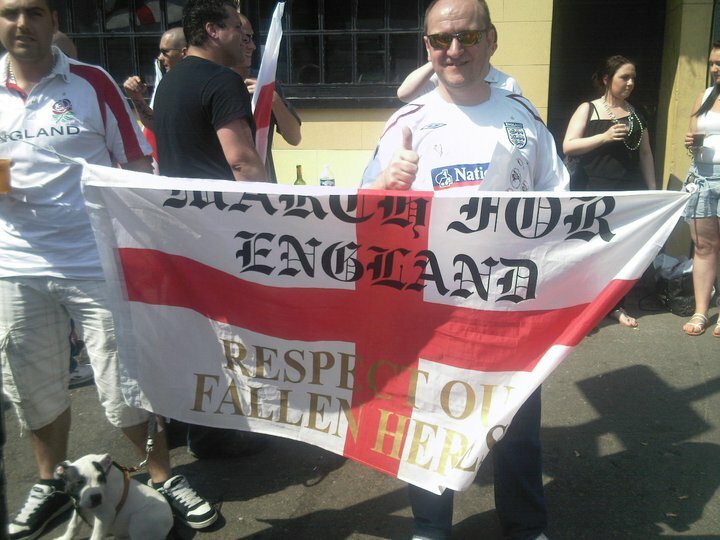 Celebrate your patron saint and fly your flag with pride – Expect to be abused and branded a ‘racist’ or fascist. Abuse the men and women who laid down their lives to ensure your freedoms – Well, you have the right to free speech that they died for whilst disrespecting their memories. In my opinion, this is the PC society gone mad. We are all members of the English Community, we should all be treated with equal respect – One country, one people and one law to cover all. This crazy pandering to minority views is creating division where none needs to exist, and is counter productive. It is time for common sense, a return to English values and a return of pride in our country. This entry was posted in English Sports & Culture, Islamist extremism, Political Correctness, St George's Day. I am English first and foremost. I am not British I am an English subject. To be British see immigration and fill the proper forms in. As an Englishman I have watched our identity slowly being eradicated. I will stand tall for our brothers and sisters in Scotland, Wales and Ireland in defence of their identity as I would stand tall in defence of my own. IT is time that this one sided view of law be dealt with. We have but ONE law and it should be good enough for ALL people in our country. IT does not matter where your religious beliefs lie, there are places where you can conduct those as you see fit. To use religion as a defence for your actions is to undermine the very concept of your beliefs. In one of the images above the Union flag was being burned, did the perpetrator of this offence get brought to book for his actions? NO! This country is filled with double standards, speak out against one faith or one group as an Englishman and you commit a crime, reverse the role and nothing happens. We should all find a way to live together and respect each other’s beliefs and cultures and allow each other to celebrate these things. The UAF have a voice, perhaps they now need an education to go with it. 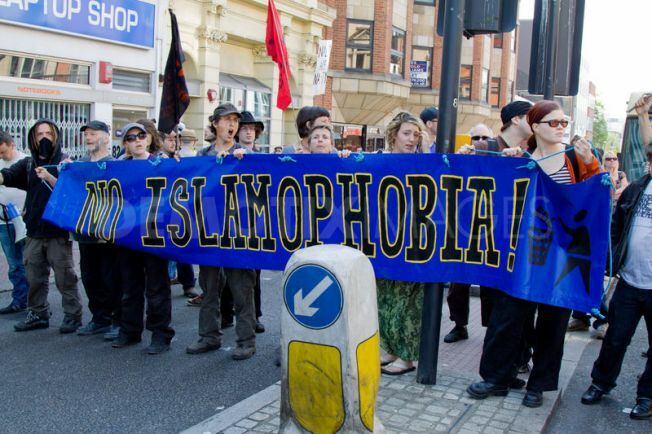 Perhaps those pictured holding the No Islamaphobia banner would think differently if their loved ones were killed by a terrorist bomb or they were beheaded as infidels? I am not against Islam or any other religion, we as people should be permitted to exercise the right to follow what ever faith we choose in peace. No one religion or people is better than another we are all the same. Cut us do we not bleed, is our blood not red? It’s time that political correctness be replaced with common sense.